This post is sponsored by iWi but the content & opinions expressed here are my own. At the age of 15, I decided to go vegetarian. Being vegetarian means I don't eat meat, poultry, or fish. No chicken nuggets. No hamburgers. No fish fillets. Well, not in the standard sense of the word, at least. It's a privilege to have access to plant-based protein options that provide alternatives to some of the meals I had when I ate meat. It might be a privilege for me, but it's becoming a worldwide necessity. Did you know the global population should reach 9.1 billion people by 2050? That means producing 70% more food for an additional 2 billion people while simultaneously combating poverty & hunger, according to The Food and Agriculture Organization of the United Nations. Those are hard numbers to look at. Will there be enough land, water, & genetic diversity to meet demands? That's where innovative brands who want to change the world come to play. iWi is an algae-based nutrition company interested in building a sustainable & scalable way to feed the world. Just what the earth needs! They grow algae for iWi Omega-3 Supplements in deserts using non-arable land, brackish water (salt water), & the sun as their main source of energy. It's exciting to have products like this available on the market. The times are changing &, to be honest, should continue to change! When I turned vegetarian 13 years ago, there were hardly any vegetarian options available in grocery stores & restaurants. 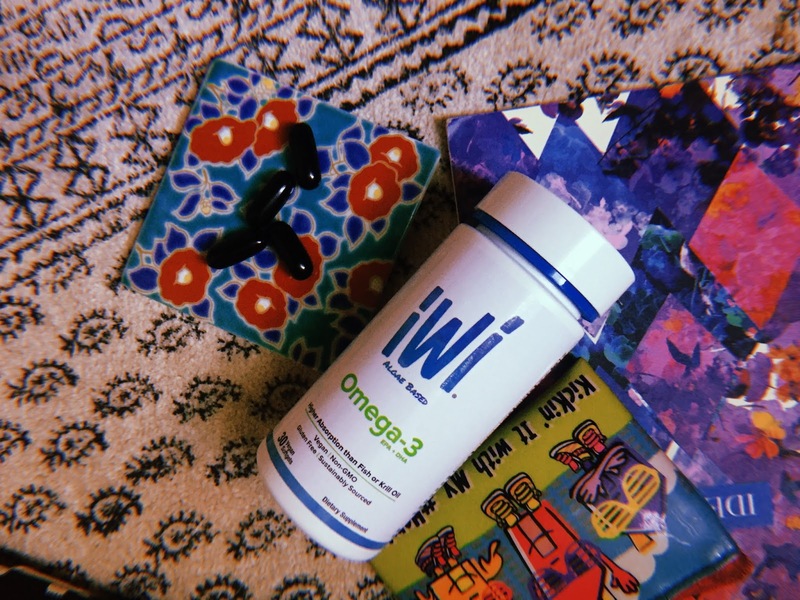 I'm happy to see a change in the landscape as brands like iWi produce green Omega-3 & protein while supporting & developing local & rural communities. Now I can have a convenient vegetarian/vegan source of Omega-3! I'm particularly excited for the future of iWi as they delve into protein powder, protein snacks, protein bars, drinks, & alternative meats & fish over the next few years. Keep your eye out for iWi. Let me know if you'd like me to delve deeper into my favorite vegetarian protein options! Use promo code 15IWILIFEO for 15% off your order. Head over to Amazon to shop iWi. It’s better for you & better for our beautiful planet. Hey Carmen. Thanks for the info! I have dabbled with vegetarianism for quite some time now... your post celebrating your anniversary really kind of hits a mark with me and everything else going on this month. Maybe this is the step that I need to take the leap and just jump for it. I am going to order some of the Omega-3 whenever September rolls around. Will the promo code expire after a certain time frame or does it last forever as long as I click on your link? :-).